The above illustration comes from Britannia: Volume The First which was published in 1675 by John Ogilby. It was one of the first road books to be published and a more readable copy is published in County Maps & Histories. 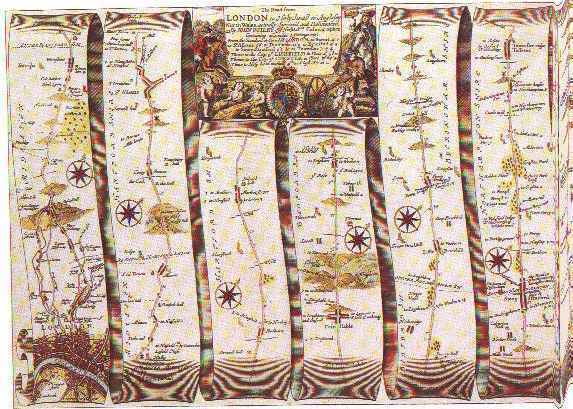 The style (and sometimes the maps) was widely copied and the strip showing the road from St Albans north through Luton comes from Britannia Depicta which was published in 1755. 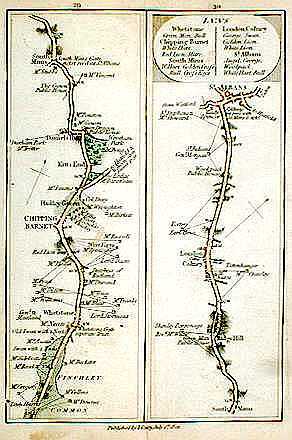 The example below comes from Cary's Survey of the High Roads from London, published in 1801. It shows the road from Finchley Common, via Chipping Barnet, South Mims, and Colney, to St. Albans. The illustration comes from Richard Nicholson's online catalogue of antique maps.